I'm always amazed at your pictures, both the quality and also the photo opportunities. I don't think that anyone has ever motivated me to click on a cut that was clearly going to be poop, before you. With the exception of the ones that are dying, nearly all the critters you photograph look happy. 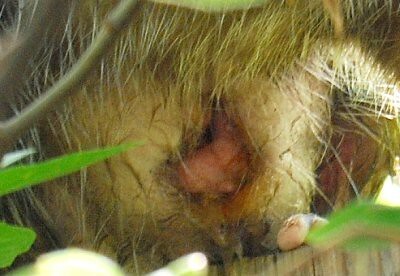 I think this possum is smiling, in a possum-y way. I like possums. It was a bit disgruntled at first. I woke it up when I was watering my compost. 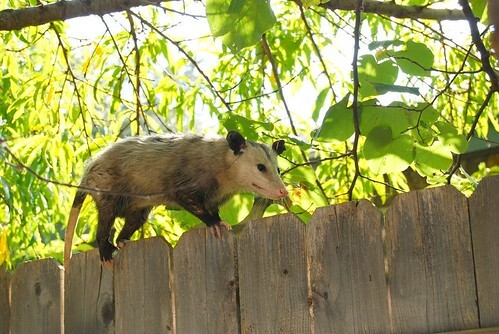 It climbed up and sat on the fence for a while quite bleary eyed and looking, in a possum-like way, almost exactly like I do before I've had my coffee. After a while it pulled itself together and trundled off to try and find a higher class hotel where the roof didn't leak.